I wanted something to accompany my GA habitat unit in relation to how environmental changes affect the organisms living there. I instantly thought of the book The Lorax. After searching, I wasn't able to come up with anything that exactly matched what my purpose for the task was, so I made my own. To celebrate Dr. Seuss, students will practice the cause and effect text structure through reading the story The Lorax by Dr. Seuss. Two versions are included. "The Lorax" is the perfect story to talk about natural resources, but also a great story to use when teaching cause and effect. Students will be able to use this response sheet to the story to review the different effects of cutting down the truffula trees. 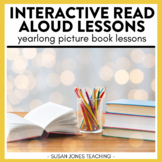 Interactive Read Aloud Lessons For The Year! Fiction books about recycling and conservation and nonfiction texts are brought together to create a fun and effective way to help students understand recycling and protecting our environment. Students will love getting the chance to turn the tables and "evaluate" authors of books used in this unit. 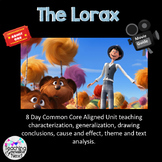 This activity includes 15 comprehension questions that are to be answered while watching the movie. 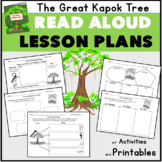 The worksheet then has students complete questions for homework. This covers the following topics: ecosystems, main idea, similes, fact/opinion, cause and effect, and predicting.